This month we've teamed up with Redress, a Hong Kong based NGO with an ethical fashion mission, to offer some top tips on repairing clothes. Redress founder Christina Dean is in month nine of her 365 challenge: every day she wears an outfit sourced from the warehouse of Friends of the Earth Hong Kong or from Traid in London. Each month a different stylist has contributed by offering style advice and practical tips on how to care for your clothes and save them from landfill. Garments are often discarded when they are damaged, so for September Redress invited The Good Wardrobe founder Zoe Robinson to share her repair knowledge. Previous months in the 365 Challenge have focused on swapping, upcycling and sustainable consumer care which included information on natural stain removal. Zoe is at her happiest when she is repairing something so she was in her element when faced with heaps of damaged charity shop finds that needed some TLC. To celebrate we are publishing our very first ‘how to’ guide created by Emily which takes you through ten simple steps to patch a pair of trousers or jeans. The trousers Emily has mended are fairly light-weight but you can follow the same steps for a light linen through to a heavy-weight denim. 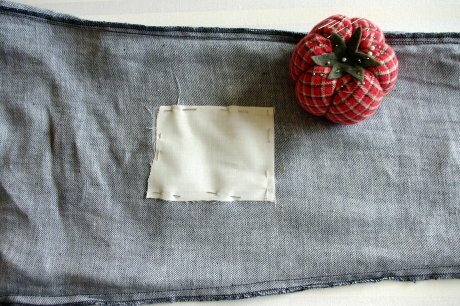 What you will need: patch of fusible interfacing, patch of fabric, scissors, pins, needle, thread (that matches the garment), sewing machine. 1. 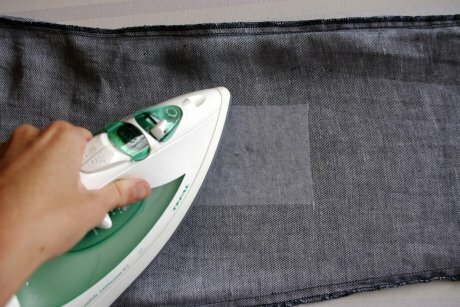 With an iron, press the area you will be patching to prepare for mending. 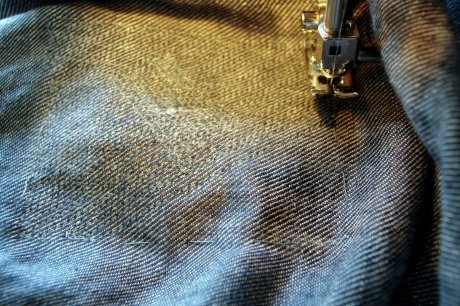 Carefully trim away any long, loose threads. 2. 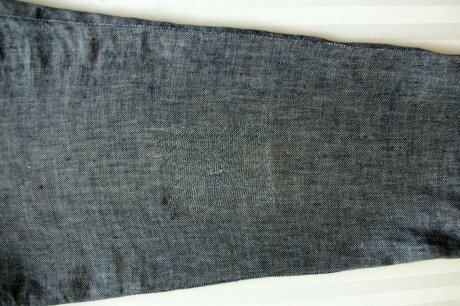 Cut a piece of interfacing to size – it is best to make the patch much larger than the hole, as often the fabric around the hole is weak and needs reinforcing to prevent future tears. 4. Cut a piece of fabric to size to use for the patch. Use a fabric that is of a similar colour and weight to the garment you are mending - we used some unbleached Fairtrade cotton we had left from another project. (The larger the hole you are mending, the more important it is to match the colour of fabric for the patch if you want an invisible mend). 5. Pin the patch in place over the interfacing. 7. The patch is now prepared and it is sewing time. 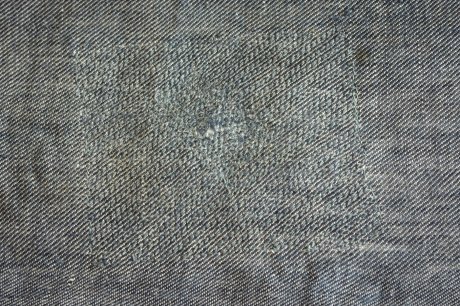 Turn the trousers right side out and, focusing on the area directly around the hole, stitch in lines across the hole (diagonal to the weave and about 2mm apart) until the entire hole has been covered in lines of stitching. 8. 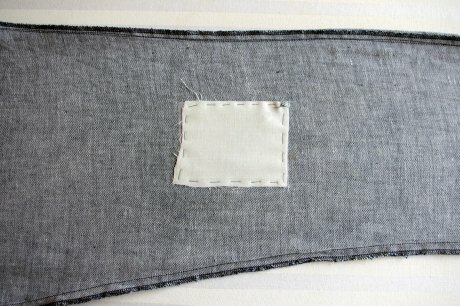 Stitch diagonal lines across the entire patch in the opposite direction to those stitched over the hole (this step will secure the whole patch and strengthen the weak fabric around the hole). Sewing the second lot of stitches along the weave will also make the repair less visible. From a distance of more than a couple of metres, this repair isn't noticeable. We appreciate not every material will camouflage a patch as well as denim and not everyone wants to walk around with a lot of stitches on their knee. 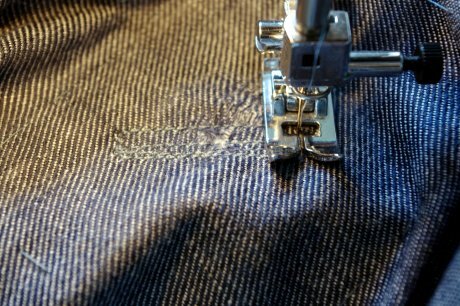 But, if you have worn a hole in a favourite pair of trousers then mending them like this will give them an extra lease of life, even if just to wear around the house. 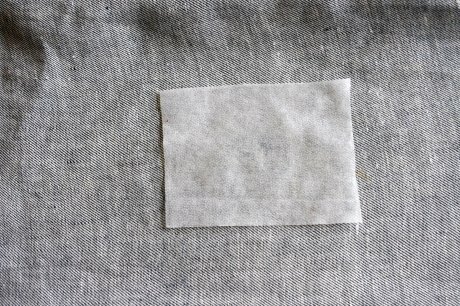 Alternatively, you can be a bit more creative by using contrasting thread to make a feature of the mend. 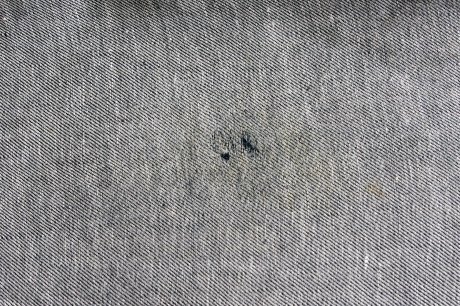 The hole in this pair of trousers was pretty small but it's always worth repairing at the first sign of damage. 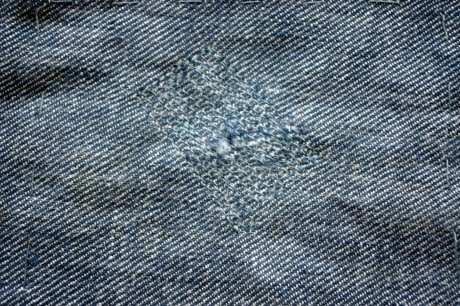 In fact, if you spot knee going threadbare before a hole appears then that's the perfect time to add an invisible patch as it will strengthen the fabric. If the hole is large, all is not lost - you can still attempt to repair following these steps. We'll have more news of the 365 Challenge later in the month. To find out more in the meantime, visit the Redress website.